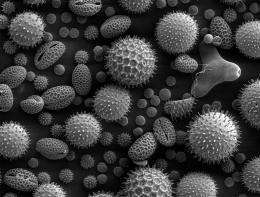 Pollen from a variety of common plants. The image is magnified some x500, so the bean shaped grain in the bottom left corner is about 50 μm long. Credit: Dartmouth College/Wikipedia. For those of us with allergies, springtime pollen is an invisible nuisance. But under the high-powered microscopes of Eleni Katifori, a biophysicist at Rockefeller University in New York, the grains of plant material become bits of origami -- they delicately fold, bend and roll themselves up to plug up leaks as they travel from flower to flower. When a piece of pollen leaves the comfortable, moist inside of a plant -- carried away by the wind or an insect -- it starts to dry out. This threatens the health of the reproductive material inside of its shell, which must survive a journey of hundreds of feet to fertilize a female plant. Katifori's images and computer models, published in the scientific journal PNAS, have shown that this loss of water creates forces on the pollen's outer shell. Because of its unique design, the shell responds by stretching and folding inwards, plugging up holes on the outside and stopping the drying out. "It's a similar process to deflating a beach ball," said Katifori. "When you deflate a beach ball, the walls deform in a way that is guided by their mechanical properties." When pollen arrives at another plant, its shell relaxes outwards, and the holes re-open to start the fertilization. While the research won't do much for your hay fever, it may help medical researchers design new ways of delivering drugs for other conditions, said Katifori. Tiny containers with pollen-like walls could carry medicine through the bloodstream and open automatically at the correct part of the body. Perhaps "unfolds fractally" would be more appropriate?